The joy and spontaneity of moments shared with loved ones. 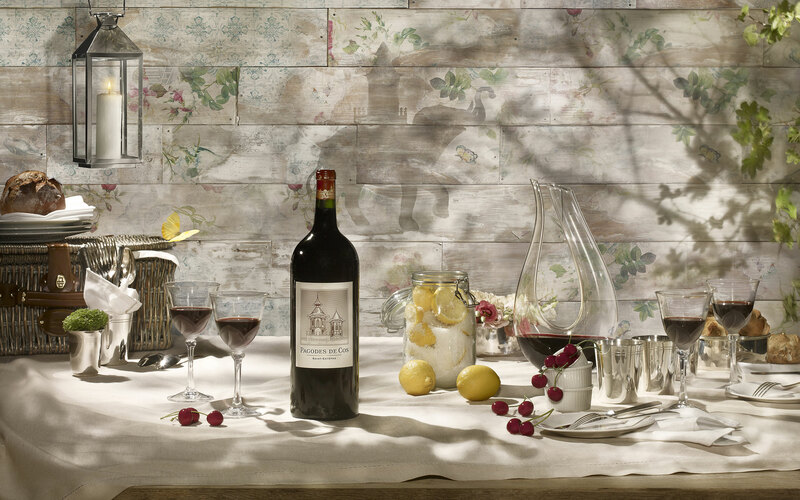 An impromptu lunch with friends is the perfect occasion to open a bottle of Pagodes de Cos. 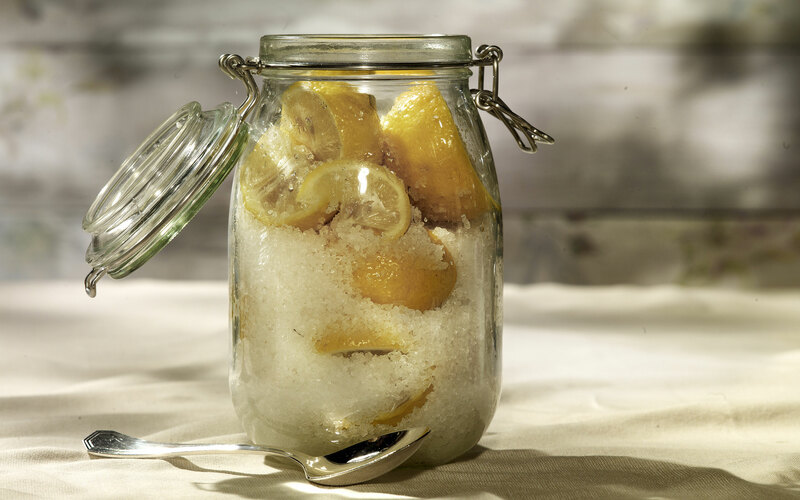 It is reminiscent of the simple pleasures of life, like homemade blackcurrant syrup, a bowl of just-picked red cherries or a freshly opened jar of citrus jam. Pagodes de Cos is at once indulgent, comforting and vivacious, like a carefree conversation with family or friends in a familiar place. Since its creation in 1994, Pagodes de Cos is made from grapes grown on dedicated plots whose vines are 35 years old on average. The 2017 vintage is characteristically round on the palate but also offers its own unique charm. Silky and immensely fresh, it is a lively, energetic wine with intense fruit. Velvety with a dense mid-palate, it is particularly flavorsome and enticing. With the 2016 vintage, Pagodes de Cos continues to affirm its personality while also hinting at the grander style of Cos d’Estournel. It is balanced and voluptuous, silky and seductive, a wine of enjoyment and pleasure. With refined yet complex tannins, 2016 vintage captures the essence of Pagodes de Cos, offering a great deal of promise for the future. Intense, refined and deep, it is perfectly balanced and voluptuous, a highly enjoyable wine. The 2015 vintage is fruity and explosive, with a silky aromatic signature. With satisfying notes of ripe fruit and fresh notes of spice, Pagodes de Cos 2015 is a glorious, balanced wine filled with promise. This 2013 is an elegant, well-structured wine that opens up with aeration. It is quite smooth on the palate thanks to elegant silky tannins, and also displays beautiful minerality. The bouquet is particularly attractive, with hints of black fruit and spice, especially black pepper. 2013 Pagodes de Cos is very accessible and forthcoming. 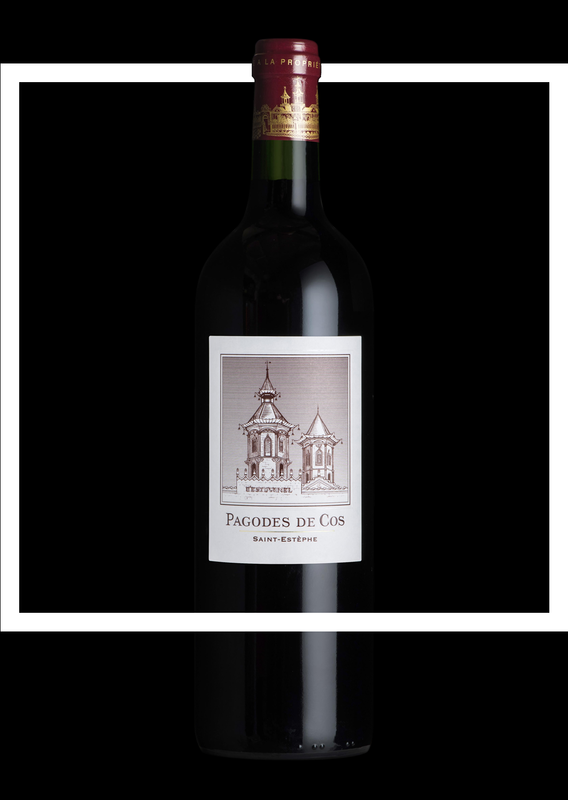 Very smooth and well-focused, 2012 Pagodes de Cos is immensely charming. Its nose of fresh black fruit also features delicate spicy hints characteristic of Cos d’Estournel. The approachable softness on the aftertaste of this young wine shows its difference with the grand vin. The elegant, silky structure is complemented by fresh, soft, eminently delicious flavours. This is a very seductive vintage. 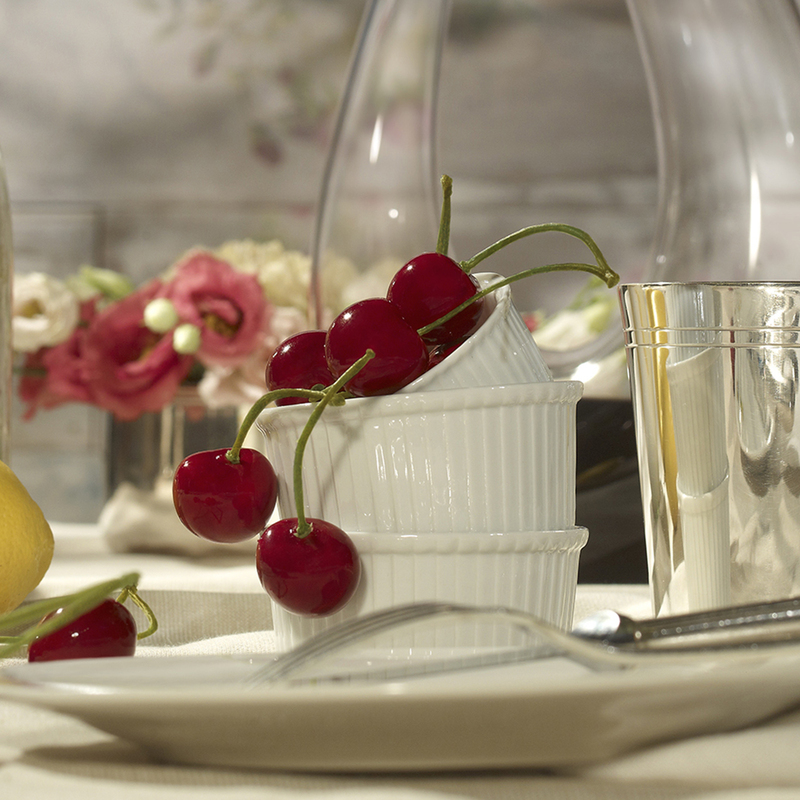 The 2011 has a ruby-red colour and a bouquet of fresh strawberries and mint. The first impression is quite remarkable. There are nuances of blackberry, blueberry, and vanilla on the palate, which are fairly long. Despite a high proportion of Cabernet Sauvignon, the wine expresses all the roundness of Merlot and has a delicious tannic texture. Softer than 2009 or 2010, it can be enjoyed as of now. 2010 Pagodes de Cos needs not blush in the company of many grand vins. 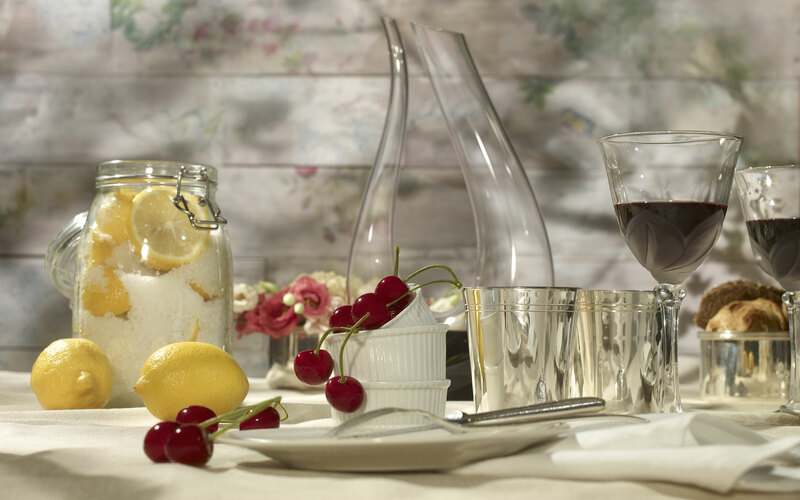 It is totally enchanting and worthy of the most discerning wine lover. Like the 2009, it is unquestionably an outstanding second wine. 2010 Pagodes de Cos has a truly marvellous texture. It is an opulent wine with fine, soft tannin. Fresh and long, it exudes tremendous elegance. The 2009 vintage starts out soft and seductive on the palate, going on to show magnificently well-defined flavours of wild berries, blackcurrant, and cinnamon. A real treat! The tannins have softened and the wine now has a beautiful satin texture. There is a subtle, underlying warmth that makes it rise far above its supposed rank in the Médoc hierarchy. In fact, 2009 Pagodes de Cos is on a par with numerous grands vins. It is clearly an outstanding, generous, perfectly ripe wine with sumptuous finesse. The 2008 vintage features an attractive nose of spices and concentrated fruits, and has revealed a suave tannic texture with age. It is altogether elegant, with soft tannins and a very engaging personality. The 2006’s dark, concentrated almost black colour gives it an aura of mystery. There is a lovely nose of pencil shavings, wet earth, forest floor, blackcurrant, and berries, as well as smoky, herbal notes. Smooth and fresh on the palate, this wine is quite delicious. 2006 once again proves that wines from great terroirs reward patience. This wine continues to improve and reveals beautiful aromas of fresh tobacco as it ages. Charming, with very aromatic hints of blackberry, blackcurrant, cherry, and fresh tobacco, the 2005 vintage has lived up to its early promise. It has a deep ruby-red colour and is very attractive on the palate with a long, smooth flavour backed up by tremendous freshness. This is a delicious, immensely appealing, easy-to-drink wine. Initial tastings revealed intense mocha and blackcurrant aromas. Additional ageing has been very beneficial to this 2004. The tannins have become resolved and are now soft and refined. 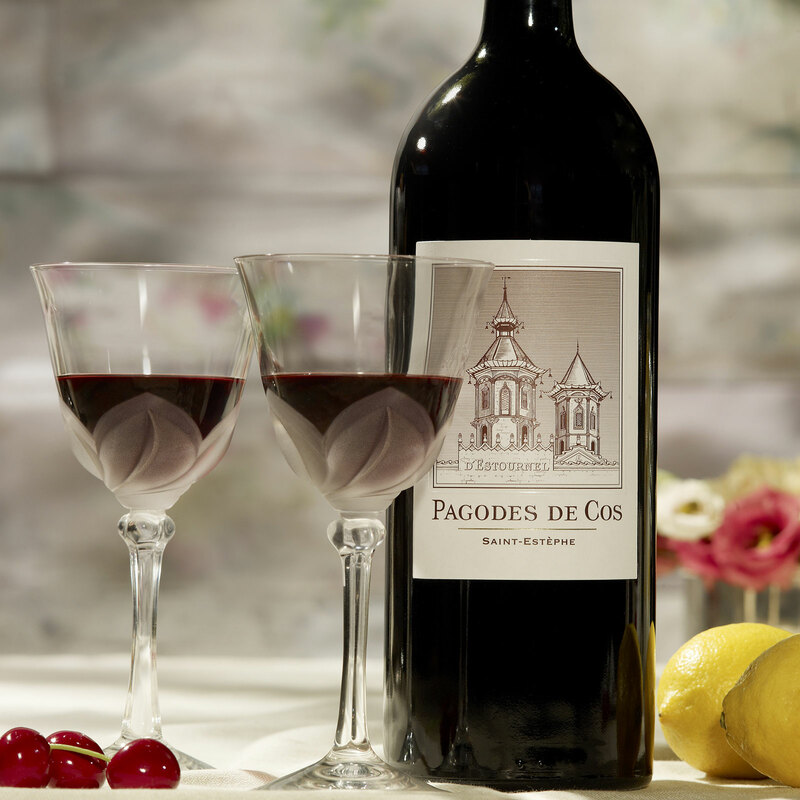 Elegant and sophisticated, 2004 Pagodes de Cos also has beautiful length. The 2003 vintage combines both freshness and an attractive forest floor component. The warm, generous bouquet reflects that sunny year and is reminiscent of game, whereas a hint of menthol on the aftertaste gives the wine a taut, vivacious dimension, and makes it come alive. Although it opened up very early, this vintage has held up well and is very enjoyable at present. With a lovely crimson colour and a soft bouquet of smoked herbs and black fruit, this 2002 is spicy and fleshy, not much full-bodied. Thick and concentrated, it nevertheless has good acidity. 2001 Pagodes de Cos tasted delicious from the very first tasting and is a truly excellent second wine. Showing well-integrated oak with a touch of vanilla and roasted aromas, it is ethereal, smooth, and extremely attractive on the palate. Displaying a beautiful ruby-red colour, this 2000 has soft tannins and a good concentration not dissimilar to that of the grand vin, but with less tannin. Its magnificent fruit is especially expressive.